My buddies Charlie and Bob just got a new Soundcraft digital mixer for their band. I helped them put the Ui16 through its paces at a couple of shows, and I learned that going digital was easier and more practical than I expected. This cool-looking mixer sports a lot of heft for a device not much larger than a shoebox. It feels sturdy, like it's built to survive a rough-and-tumble life on the road. Bob and Charlie mounted their Ui16 in a small rack, along with an AC power conditioner. 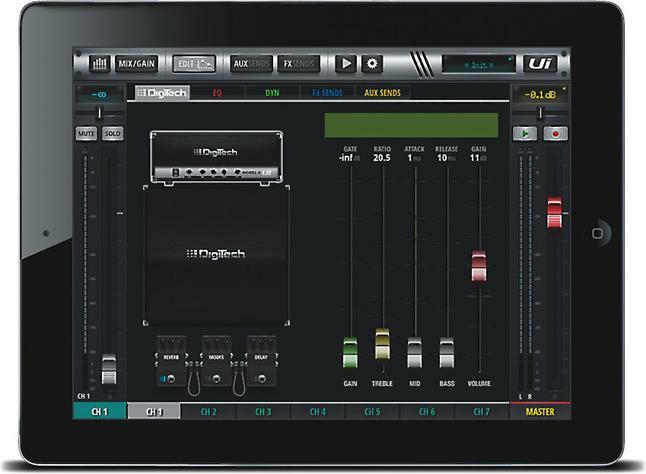 One of the main appeals of the Ui16 is that after connecting the microphones and amplifiers, the operator mixes wirelessly from his phone, tablet, or laptop. 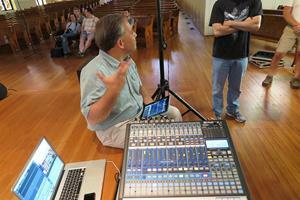 There's no need to run a lengthy and heavy multi-core snake cable through the audience to a mixer. We first set up the Ui16 in Charlie's basement. We connected a laptop and two smartphones to the mixer's Wi-Fi hotspot. 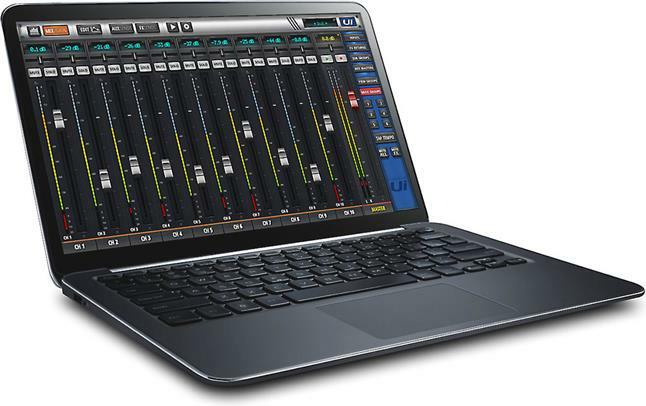 Then we launched our web browsers and went to the mixer's address.The Ui16 sent the mixer software to our devices. We didn't have to download or store any apps. The mixer app simply appeared on our screens and we started mixing immediately. 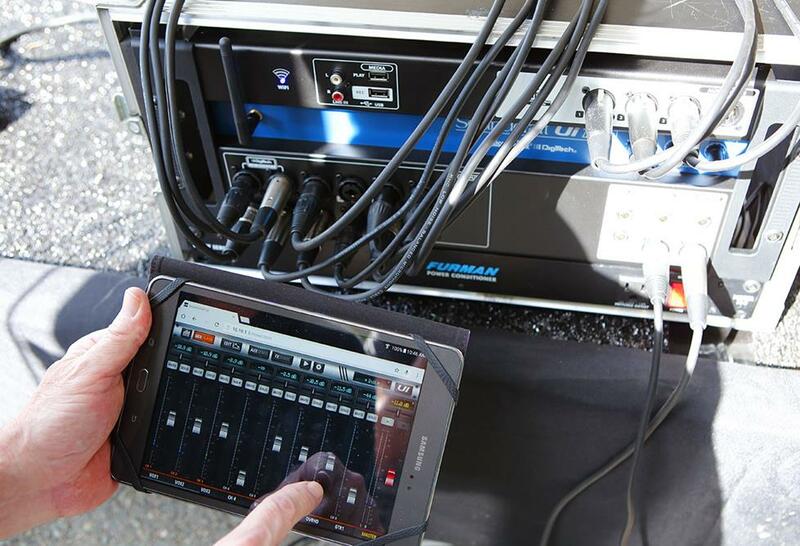 A digital mixer's built-in effects save you enormous amounts of space, weight, and expense by eliminating outboard equipment and the tangle of cables involved. To duplicate the amount of processing done inside the Ui16 would require five 31-band equalizers, twenty-one noise gate/limiter/compressors, a reverb unit, a digital delay, a chorus echo unit, and a room-style reverb. And that doesn't even count the 4-band parametric equalizer and de-esser on all sixteen input channels. I played with the reverb at first. Well, I turned it up said something into a mic, and then heard, "Too much reverb," from Bob. I played around with some settings and found I could get pleasing effects easily. The presets sounded pretty good. The onscreen controls mimic analog controls, so understanding what everything does was easy for me. I love slap-back echo and it took me about two seconds to dial-in a great-sounding delay. The compressor/limiter also had intuitive controls and certainly squashed the dynamics out of my voice when I applied it liberally. Soundcraft loaded channels one and two of the mixer with DigiTech amp modeling software that simulates over fifty different guitar amplifiers and over twenty different cabinet combos. Charlie tried it out and very quickly got a sound he liked. He was confident that he could set up a preset that he could use if his regular guitar amp stopped working. The mixer's live debut was with Lon, the band's usual soundman, at the controls. The venue was a vineyard bandstand overlooking the Blue Ridge Mountains on a beautiful and sunny summer day. The first thing Lon and I noted was that it was almost impossible to make out what was on the screen unless the device was in the shade. After a quick line check to make sure all channels were working, he asked the band to play a song. By the time that one song was over, Lon had the mix dialed in and was fine-tuning the EQ and compression on various channels. He quickly, and seemingly effortlessly, "rang out" the monitors while standing at each musician's position, turning up the monitor until a feedback note rang out, and then getting rid of it with the 31-band graphic equalizer available on each output channel. The musicians are all competent professionals and sounded great that day. I'm familiar with the sound of the microphones and loudspeakers they used, and I heard no unwelcome sound coloration due to the audio mixer. The vocals seemed a little crisper than I like, but that was due to Lon's EQ and compression settings, not the mixer's mic preamps. Charlie made an interesting observation. He plays a wireless guitar, and every once in a while he will jump out into the audience and walk around playing lead. "The band sounded clearer and the instruments seemed more distinct than usual," he said. I pointed out that he heard the results of Lon applying dynamic compression to not just vocals, but also the kick, snare, and bass guitar. 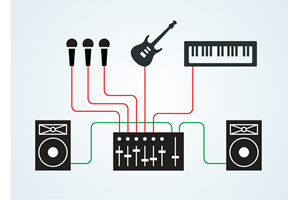 This evens out the levels, allowing each instrument to have its own space in the mix. During a break, Jim, the drummer, pulled out his smartphone and checked out the mixer. He was a bit scared with the realization that he could, at the flick of a finger, destroy the carefully crafted mix. He carefully logged off without touching anything. I recommend that the band enable password protection to limit access to the Ui16's network during shows. Charlie and Jim are web editors at Crutchfield. 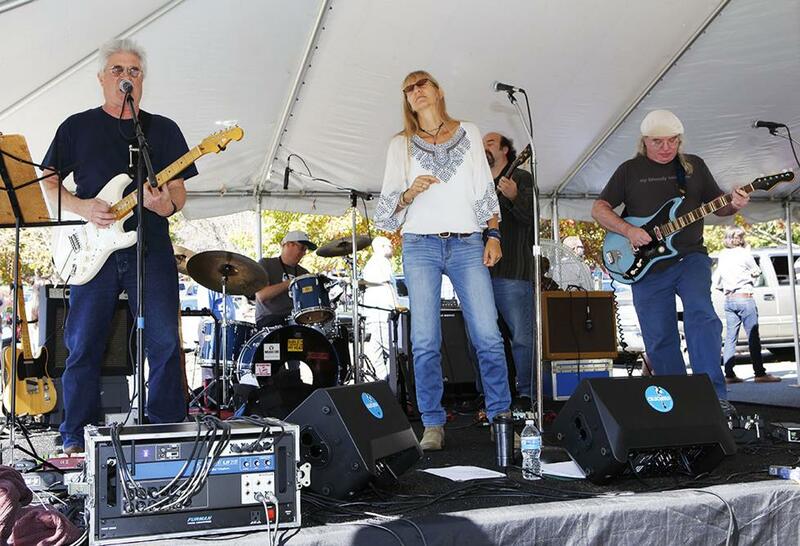 They played together in a pick-up band during our recent Employee Appreciation Day. I used the Ui16 and Charlie's Android tablet to mix the set. The challenges for me of mixing on a tablet are that my eyes can't always see the small graphics clearly, and my fingers don't always operate touchscreens properly. I wasn't about to use this mixer without updating the firmware. So before the set, I went to Soundcraft's website, downloaded the latest version onto a thumb drive, and plugged that into the Ui16. The mixer updated itself exactly as the instructions said it would. The result was that during the short show I mixed, the tablet I used only lost connection to the Ui16 twice — both times due to operator error. The heel of my hand touched something onscreen it shouldn't have and to get back to where I wanted I rebooted the tablet. The show went on without a hiccup. The author mixing the sound of the band playing at Crutchfield's company picnic. How did the show go? Judging by all the polite "sounds good" statements from friends, I at least didn't make the band sound bad. In fact, they sounded good to me — but that was more due to their professional playing than to my mixing. I was mainly reinforcing the vocals to keep up with the drums and electric guitars. But the band got enough compliments to ensure in my mind that the mixer did its job and did it well. I definitely missed the cool factor of manning a large field of knobs, buttons, and faders. But every control I could imagine was accessible on that little 6-inch screen with a couple of finger taps. This powerful mixer has all the features I would need to mix sound for a small band. For instance, during the company picnic show, I used no compression, nor did I ring out the monitors, because the volume never got that loud. Everything about the Ui16 user interface is straightforward, logical, and intuitive. Even though the control surface I used was not much larger than the palm of my hand, I quickly got used to it. The mixer did not color the sound in any way that I could detect, and it was fun to use. 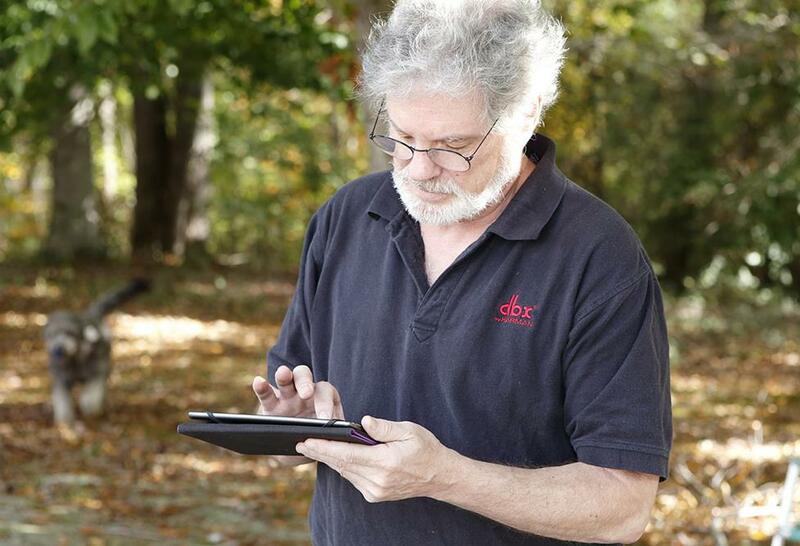 It seems this old analog dog is capable of learning a new digital trick after all. Try it for yourself: Check out this cool demo of the Soundcraft Ui mixer's graphical user interface. 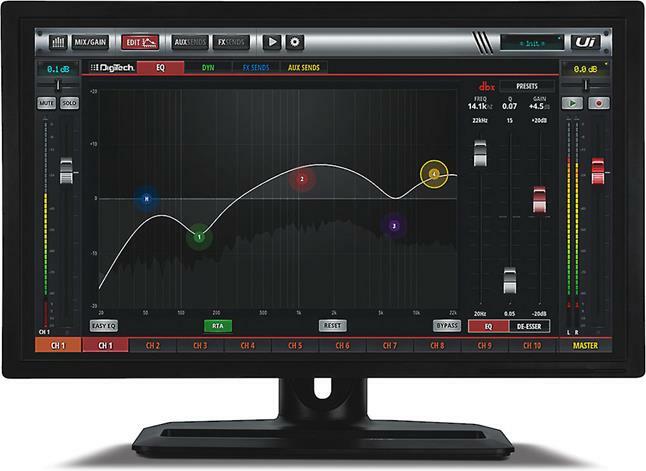 For more information on the Soundcfrat Ui16 digital mixer, click here. 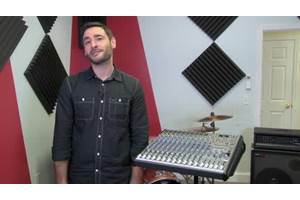 As of now, 1 year or so after release of this into the market, Soundcraft/Harmon has only had one firmware update to the product, the HDMI is still unavailable for use, but at least the unit seems to work with little effort, there are def more wifi dropouts than stated in this article, in 3 hours we had at least 10-15 but they did re-coop themselves very quickly. Great one.I like it,because we can use it on the stage to adjust the channels wirelessly. Aaron, The Ui16 has a USB port that allows you to record the main stereo mix to a USB memory stick, which I think is at least as convenient and easy to use as an SD card. But you can always ask Soundcraft about it. 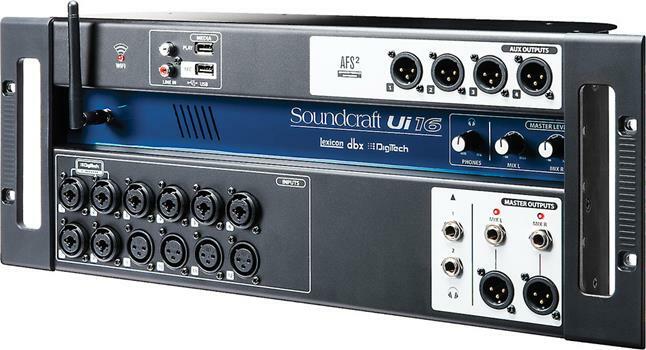 Why doesn't soundcraft put a SD card slot in it so one could get a board mix?